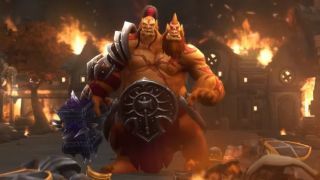 Our Tom Marks called Cho'Gall the "strangest MOBA experience I've ever had" and "oddly intimate", which is understandable considering the fact that he's controlled by two players at the same time. One player takes Cho, and controls the legs, while the other, Gall, operates the indecisive ogre's ranged offense. The WoW villain's precise skills are detailed in the latest ability video above and in the New Hero section of the latest patch notes. His super has one player rolling an energy ball that the other must detonate. There is going to be a lot of shouting on comms in HOTS this Christmas. Cho'Gall is available now, but can't be bought with real or in-game money yet. For now, players must complete win two games as Cho or Gall "while partied with a player who owns Cho’gall" to unlock him. If you've unlocked the ogre you can earn a sweet sum of 2,200 in-game gold for winning four games with players who haven't unlocked him yet, thus encouraging the rapid spread of the hero. BlizzCon attendees get Cho'Gall automatically, and will serve as patient zeroes for this experiment. The patch notes also detail the Towers of Doom battleground that's currently undergoing testing on PTR servers. You have to capture a series of spawning altars to attack the other team's protected core. Claiming bell towers increases the potency of altars, helping a dominant team to quickly polish off opponents. Blizzard notes that "Towers of Doom will not be available in the live version of Heroes immediately on patch day, but will remain playable on the PTR until playtesting concludes on November 24."